Sea-Doo enthusiasts, dealers, and Sea-Doo X-TEAM racers collected nearly two dumpsters worth of trash in Florida as part of the Earth Day weekend Sea-Doo Clean Sea Project. To commemorate its 50th anniversary, Sea-Doo organized the shoreline/island clean-up effort in two Florida locations; Miami and St. Petersburg. This clean-up effort was to keep our waterways trash-free, so that everyone can enjoy the beauty of nature. Hundreds of pounds of debris, including mattresses, old shoes, foam, fiberglass, hundreds of cans and bottles were collected from area islands and shorelines. PWC enthusiasts from area watercraft clubs, Sea-Doo dealership staff, and Sea-Doo race team members of all ages volunteered. 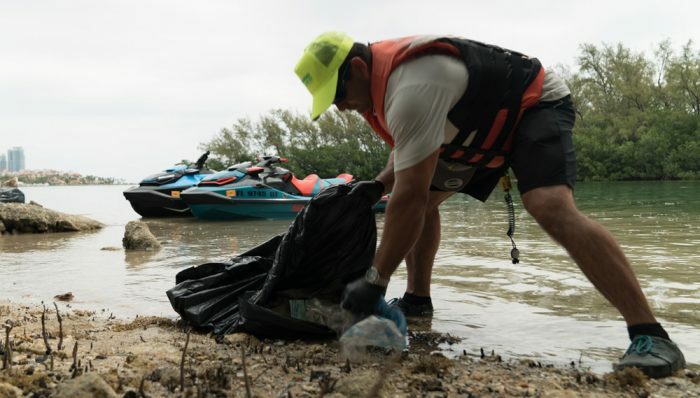 The three-hour effort was hosted by Sea-Doo with support from Waste Management and was based at Miami Marine Stadium on Virginia Key and Maximo Park and Boat Launch in St. Petersburg. Sea-Doo provided all Clean Sea Project volunteers with gloves, trash bags, clean up caps, a healthy lunch and water from a recyclable water cooler. Everyone is invited to participate and support this Clean Sea Project effort in their community. We hope this can lead to a movement among a network that works together for something bigger than us.